The FlexPod device mounting solution is ideal for your Smart Phone or small GPS Unit! 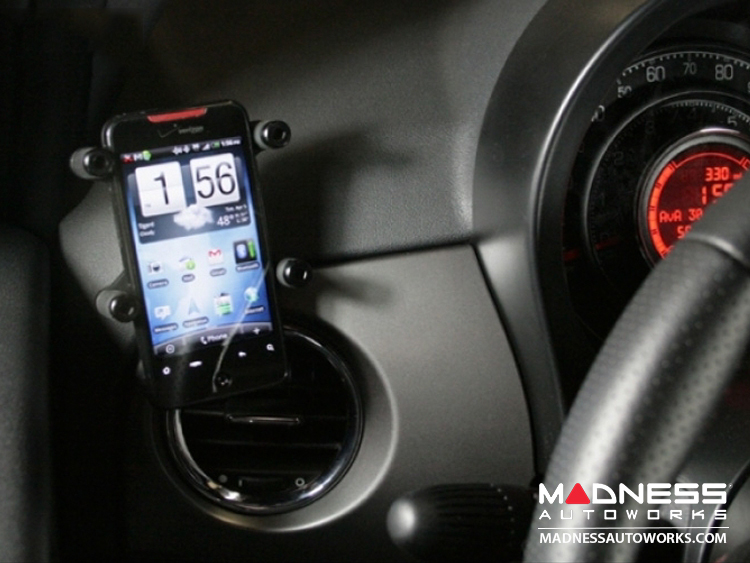 Whether you have a Droid, an iPhone, a BlackBerry or something much cooler we can provide you with a secure mounting solution. All of the supported phones clip right into the cradle effortlessly, and the FlexPod system allows the mount to be securely attached without damaging your precious 500. Clip in your phone and don't worry about it until you reach your destination. and more all the time! Ideal for use with the FIAT Blue and Me handsfree operation -- keep your hands on the wheel and your eyes on the road. If you have to fumble for your phone in your pocket or purse when it rings, or when you need to make a call then you are losing focus. Snapping your device into the cradle when you get into the drivers seat means you always know where it is, and it becomes as much a part of your FIAT 500 as an in-dash system, letting you see who is calling or who you want to call without looking away.Quick and Seamless Installation in your FIAT 500. The Universal Scissor Mount is a great solution for you if you have a case on your iPhone, iPod Touch, Blackberry or other device. The Scissor Module uses rubberized pegs and a spring loaded cross-grip design that pinches your phone, keeping it in place. You can adjust the device within it's grip to avoid buttons or allow access to plugs on any side of the device. There are a lot of great smart phones out now, and more come out every few months. That is one of the reasons this mount was designed. It is a clever cradle that will hold a variety of devices. The Scissor is best for gripping phones over 2 inches but less than 2 5/8 inches wide.